Essentials for your organization’s first MDM deployment. IBM’s security platform provides the security intelligence to help organizations holistically protect their people, data, applications and infrastructure. IBM offers solutions for identity and access management, security information and event management, database security, application development, risk management, endpoint management, next-generation intrusion protection and more. 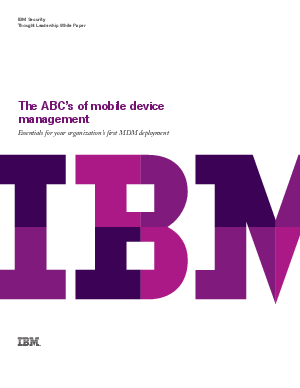 IBM operates one of the world’s broadest security research and development, and delivery organizations.